Fundsmith has launched a new fund called Smithson. This is exciting, because Fundsmith is such a successful asset manager. It's global equity fund has beaten its index consistently over a very long period of time. So what is it that this new fund is setting out to achieve how much will it cost and how likely is it to succeed? Will Smithson beat its benchmark? Want to ask your own questions? We can get an idea of why the fund is being created from this graph which shows the outperformance by Warren Buffett relative to the S&P 500. In one year in the mid 1970s Warren Buffett outperformed the S&P 500 by over 100% and then in the late 70s by about 80%. 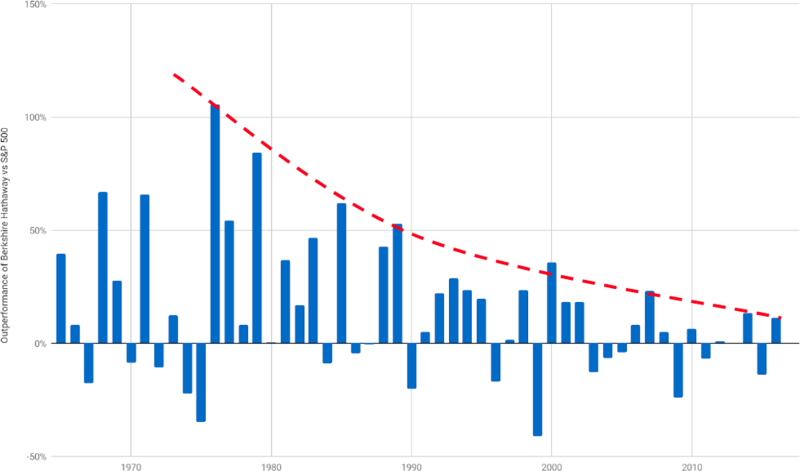 What you can see over time is that gradually those peak outperformances tend to fade away. The reason for that is because as the fund grew Buffett could only buy very large companies and large companies won't outperform the S&P 500 by such a large degree. You can think of this dilemma as the Curse of Scale. As a successful fund grows by attracting more investor capital and investment capital gains its potential outperformance shrinks over time. Fundsmith is nowhere near as big as Warren Buffett's Berkshire Hathaway but it's still pretty chunky at £17 billion. To take a very simple approach, if we say that the fund invests equal amounts in all the 27 shares that it holds then each of those holdings will be £630 million. What you don't want to do is to hold too much of a single company's stock. So let's say that you don't want to hold more than 10 percent of its total stock that would mean you'd be restricted to companies which are £6.3 billion or larger in total size. 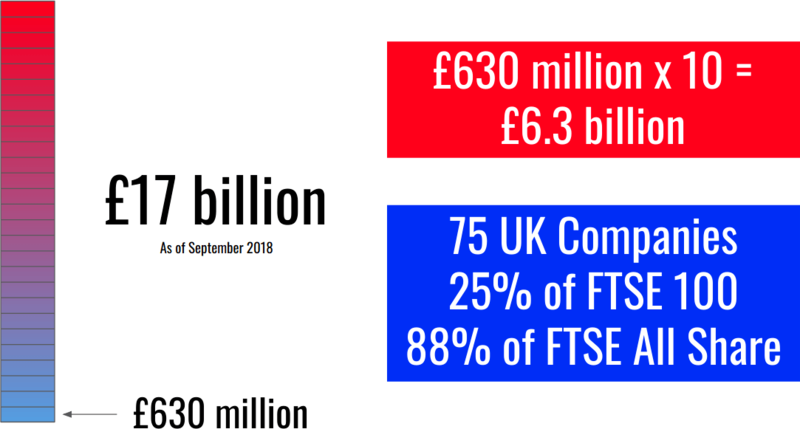 To put that into context only 75 of the companies that trade on the London Stock Exchange would qualify by being large enough and that would rule out 25% of the FTSE 100 and if we look at the much broader FTSE All Share it would rule out 88% of the companies. As Fundsmith grows the problem will get worse because more companies will be ruled out as they simply don't have enough stocks to buy. 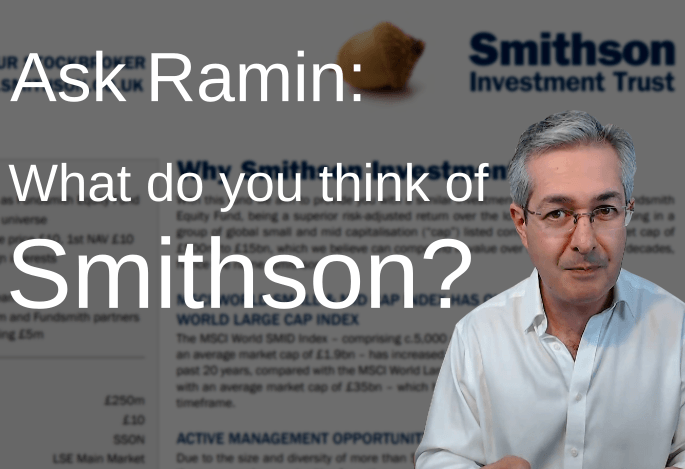 This is why Smithson has been structured as an investment trust. Once the capital for an investment trust has been raised it remains the same size that means as people buy and sell the fund Fundsmith won't be forced to buy and sell the underlying stocks. The difference between the buy and sell price for small companies is relatively large so every time Fundsmith bought and sold stocks it would effectively be paying a tax to its broker. By being structured as an investment trust Fundsmith has more control over the rate at which it buys these low liquidity stocks. There's lots to like about Smithson. For example, there are no fund launch fees the usual situation when a new fund launches is that you'd have to pay part of those launch fees but Fundsmith absorbed those fees so its investors did not have to. 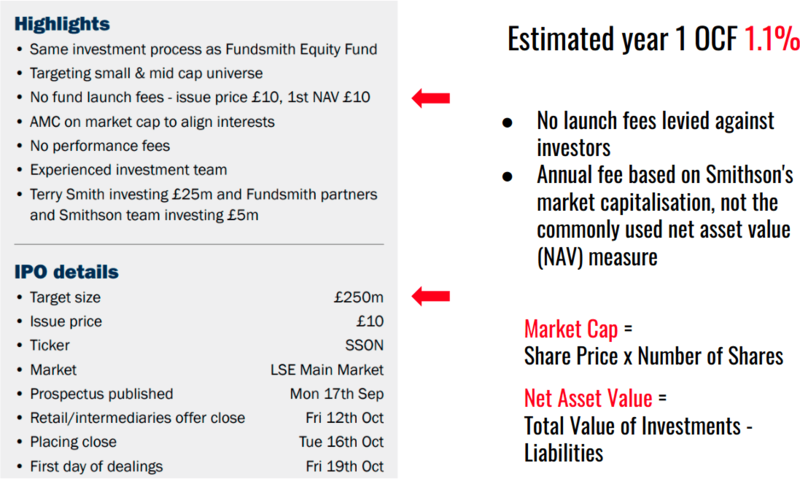 We can see the planned size of the fund before launch was fairly small compared to Fundsmith global equity at just £250 million. That is by design, because if Smithson is going to target small and mid-cap stocks it can never grow to a very large size. However, the popularity of the fund meant that Fundsmith eventually decided to increase the size of the fund to £822.5 million at launch in October 2018. The ongoing charges figure (OCF), which is how much you'll pay for the fund each year, is estimated to be around 1.1% which is comparable to Fundsmith's global equity fund and at the lower end of active management fees. Another innovative feature of the fund is that the fee is based on the market capitalization and that's different from the net asset value (NAV) of the fund. 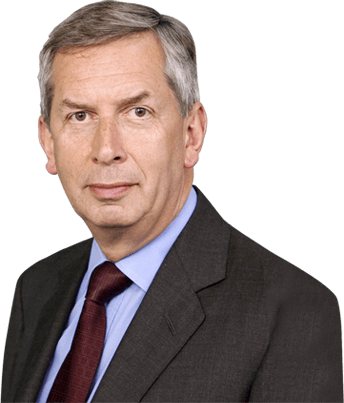 The reason given by Terry Smith is that this aligns the interests of Fundsmith with that of its investors. So what do we mean by that? The market capitalization of an investment trust is just the share price times the number of shares and that's simply based on what people are willing to pay for the company. If the company has a good run the share price can go well above the net asset value which is the total value of the investments minus the liabilities. Although it seems odd, with an investment trust sometimes the market capitalization is more than the value of the portfolio inside the fund. If the stocks are trading at a premium to the NAV that is often to do with periods of very strong performance as it drives up demand for the stock. So if Smithson does outperform it'll become very popular, the market cap will increase above the net asset value, and as the fee will be based on the market cap this will increase Fundsmith's income. This will produce an even greater incentive for Fundsmith to outperform. 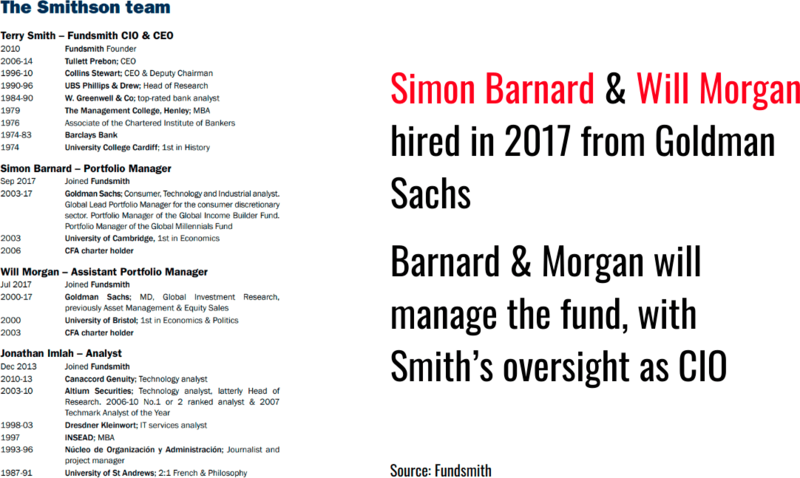 Another salient fact about the fund is that it's being run primarily by Simon Barnard and Will Morgan who are a pair of asset managers hired in 2017 from Goldman Sachs and although Barnard and Morgan run the fund on a daily basis Smith has oversight of the fund as Chief Investment Officer of Fundsmith. As with any Fundsmith fund it applies these three fundamental principles for investment. Buy Good Companies Number one is to only buy good companies for Fundsmith the primary metric they look at is the return on capital employed they like companies which have a big cash flow and which have potential for growth and the growth aspect is particularly salient for these small and mid-cap companies. Do Nothing The third point, which is great, is that they do nothing once they buy a company that they like they stick with it they don't trade too much and erode their return by paying broker fees. It's always interesting to look at the benchmark for an active fund because that tells you the kind of market which it's trying to beat. In this case it's the MSCI World SMID index. 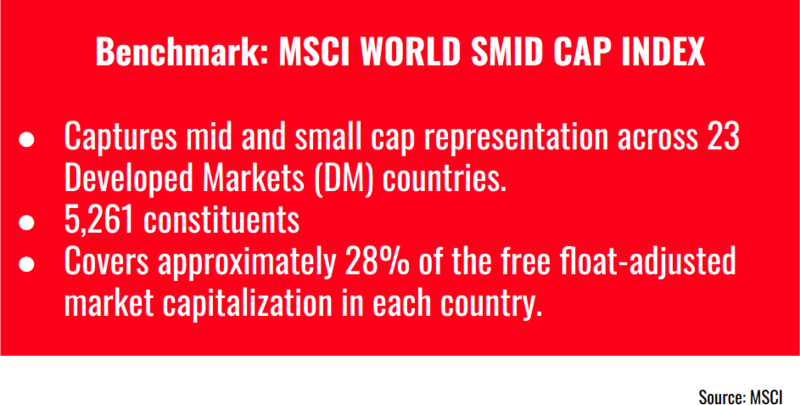 SMID stands for small and mid-cap. You can see that this choice of benchmark gives Smithson a very large geographic representation because it covers 23 different developed market countries and a total of over 5,000 stocks. However, when Fundsmith applies their stringent definition of a good company this narrows down the field to just 83 companies in their investable universe. At any one time they'll only invest in about half of those companies, just the ones the fund managers consider will offer the greatest return. The question we're all asking ourselves is whether Smithson will succeed which is to say "will it beat its index net of fees?". I think the strongest thing going for Smithson is that it's being run according to the principles of Terry Smith who's a seasoned, successful and highly skilled investor. If there is a secret recipe for good investing Terry Smith has certainly got it. 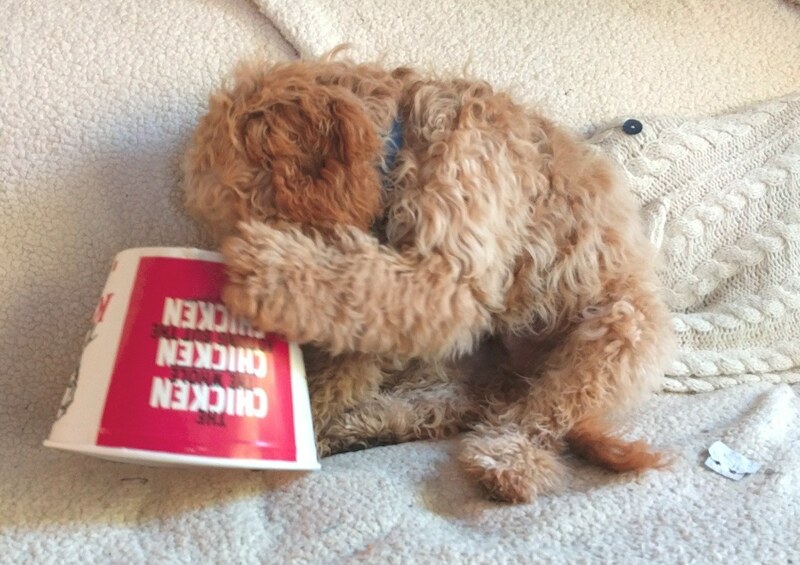 Another company which has a secret recipe for success is KFC and my dog Teddy and I are both very keen on their fried chicken. 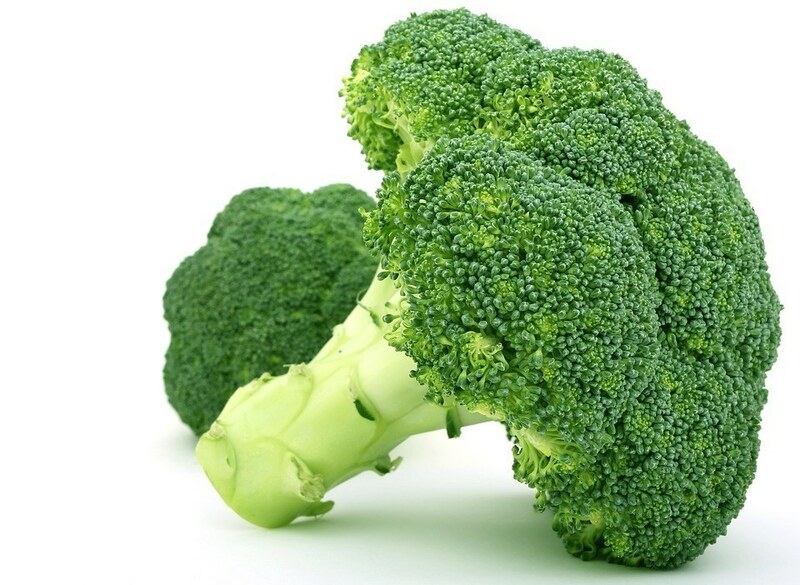 The combination of that crisp coating with the delicious, tender chicken inside is simply irresistible, but if KFC were to launch Kentucky fried broccoli would it be quite as popular? I don't think so. The secret recipe that works in one domain may not translate into another domain. 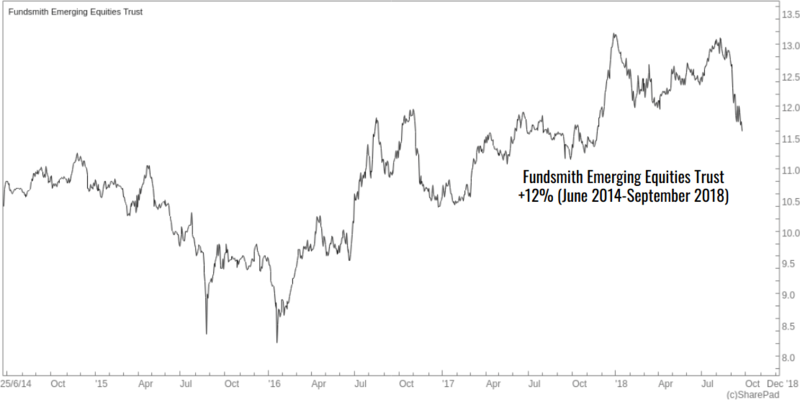 Coating small-caps in the Fundsmith batter may not produce a successful recipe, as we can see in the case of the FEET fund. In fact we've seen a fund launch like this before from Fundsmith. In 2014 Fundsmith announced that it was going to open an emerging markets fund which is called FEET: the Fundsmith Emerging Markets Trust. The reason for its launch, as well as some of the attributes of the fund, are very similar to Smithson. As with small companies, Emerging Markets have the potential for greater long-term growth than developed market large caps as the growing middle classes in developing countries demand more goods and services. Also, just like small caps, emerging market stocks are relatively illiquid which means they are more difficult and expensive to buy and sell than developed market stocks, and so FEET was also structured as an investment trust to manage that illiquidity. Terry Smith had a very bold view when he set up the fund. He decided to keep away from the very large market in China and to focus more on South Africa and on India because that's where he saw the greatest growth potential. Although it's only been four years since the launch of the fund the return has not been amazing. FEET has gained about 12% since launch and the graph above shows the price of the fund over the four year period from June 2014 to September 2018. 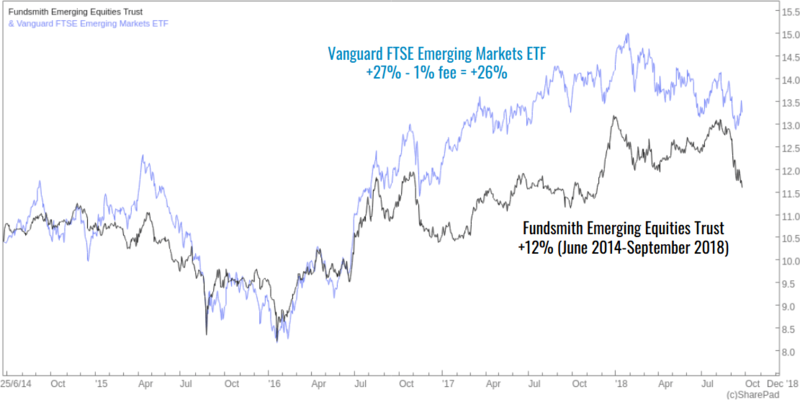 If we compare that with another Emerging Market equity fund, in this case the Vanguard FTSE Emerging Markets exchange traded fund, the return over that same period would have been twice as much. 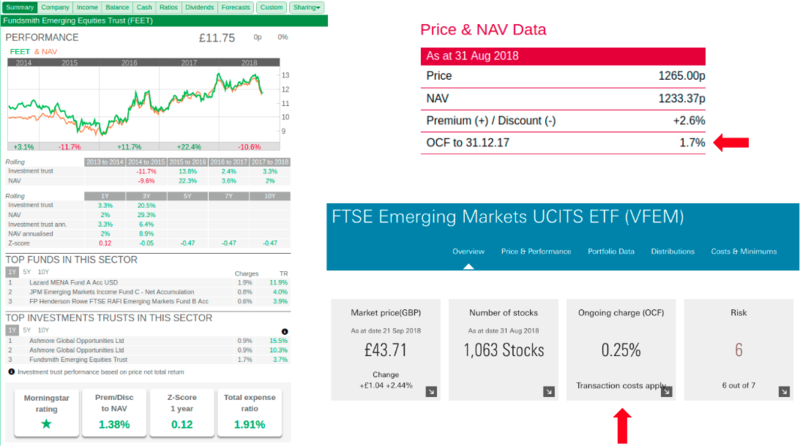 That comparison is a low bar for outperformance, as the Vanguard FTSE EM fund is a cheap, passive fund that simply tracks its Emerging Market stock index. The image above shows ShareScope's description of FEET. Notice in the bottom left that FEET only got a 1-star Morningstar rating and also notice that it doesn't trade at a premium to its NAV. The premium is only 1.38% which is negligible and that's largely because of the mediocre return. 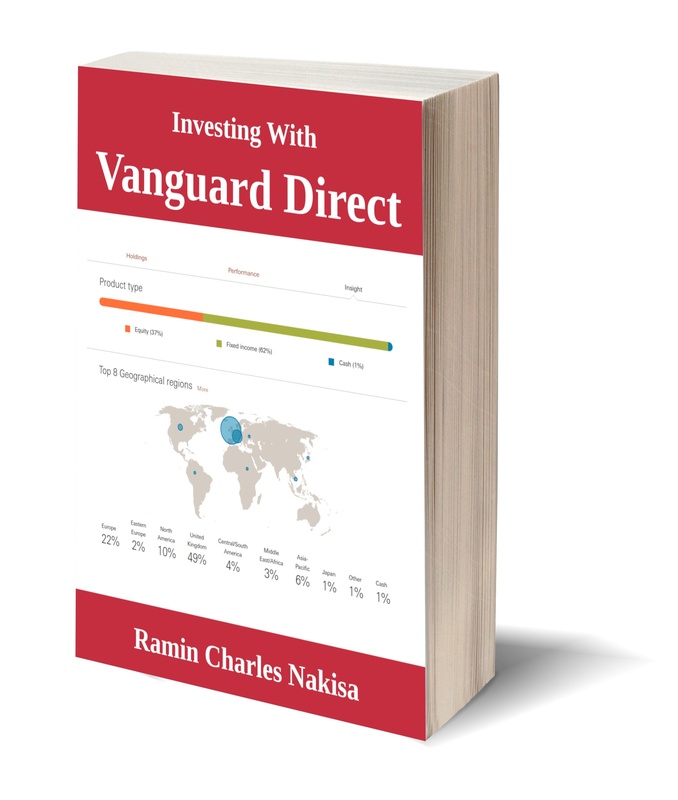 If we look at the cost of owning the fund it's 1.7% per year, that's the ongoing charges figure, whereas for that Vanguard fund you'd only be paying 0.25% per year. So the fee for the passive fund would be six times smaller, and yet the return on the passive fund would have been twice that of the active fund. So here we have a repetition of the sorry story of an active fund where you're overpaying for underperformance and it's very disappointing to see that from a company like Fundsmith. So we can see that applying all of those stringent criteria that Fundsmith uses has simply failed to translate into success, at least so far, for the FEET fund. My concern is that we'll see the same thing happening for the Smithson fund. If you want to ask your own questions then why not join us on our live Q&A session? It's informal, friendly and you can ask anything you want. All you have to do is to support us on Patreon for $5 a month or more. Then you can join our live Q&A sessions, and chat with us on our Slack Channel.